It’s so easy to take part in the Ceria Raya bersama F&N contest. You just need these four easy steps to win big! 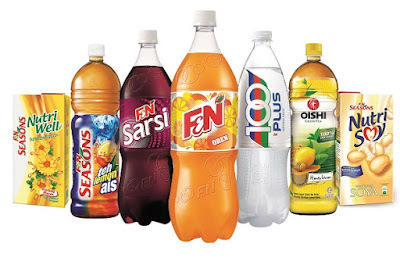 1) Buy any participating F&N products. Participating brands are 100PLUS, F&N Fun Flavors, F&N SEASONS NutriSoy, F&N SEASONS NutriWell, F&N SEASONS Tea and OISHI. 2) Answer 3 ‘TRUE’ or ‘FALSE’ statements on the entry form. 3) Complete the entry form with your personal details. 46899 Petaling Jaya, Selangor Darul Ehsan. Five very lucky finalists will be picked from qualified contest entries and invited to participate in an on-ground event in August, where they will be put through a series of challenges to win the top five unbelievable prizes of the contest. The winner are selected based on a series of on-ground challenge and will be given a chance at ‘pick and win’ the right key or combination to win the Ultimate Grand Prize. He or she will have a chance to walk away with a 20’ X 80’ dream house (2429 sq. ft. built up space) located in prestigious development of Laman Glenmarie, Shah Alam, Selangor worth RM1 million! · the fifth highest score will win the Fourth Prize of RM10,000 cash. And that’s not all – F&N will be giving out five (5) daily prizes of RM200 cash each, for 61 consecutive days to lucky winners! So, what are you waiting for? 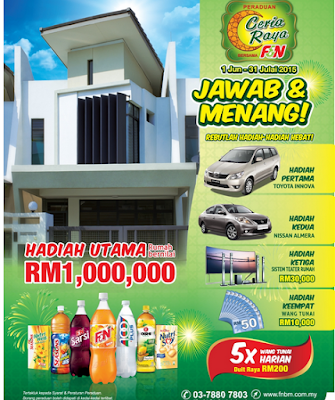 Spread the festive cheer and be one step closer to owning your RM1 million dream house with Ceria Raya bersama F&N contest! 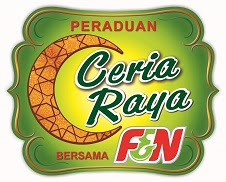 Ceria Raya bersama F&N contest is ongoing to 31st July 2015. Contest entry forms can be found at all participating outlets nationwide, and downloadable from FNBM website, http://www.fnbm.com.my/. More information on the contest is available on the website. NOTE: *in the event where there is no Grand Prize winner, he or she will win the First Prize, and the finalists will respectively win Second Prize, Third Prize, with the fourth and fifth highest score will win the Fourth Prize with RM10,000 cash each.